Las t month I started work as a “Beer Smith” aka bartender at Fiction Beer Company, one of the many local nano-breweries. It’s been great being involved in the actual industry, and is a nice chance to learn and chat about the processes of brewing and serving craft beer. As befits the name everything in Fiction is book themed. 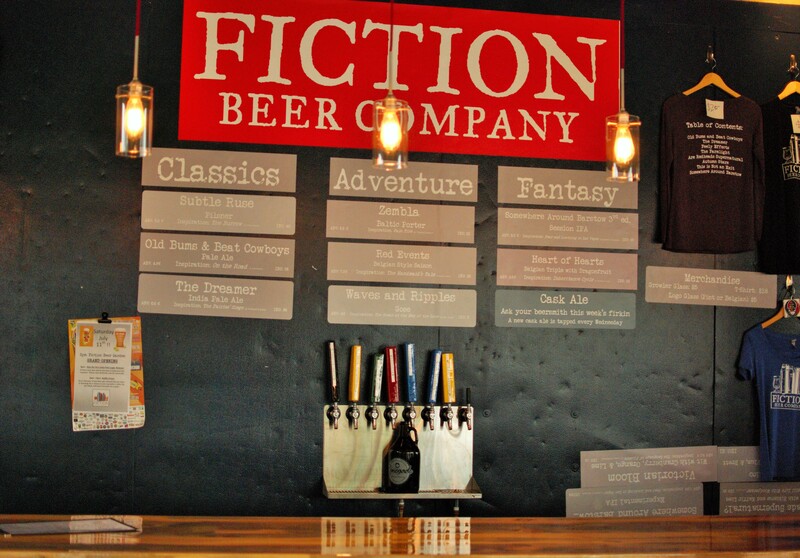 The beer names are all inspired by books, the bar is literally made out of books, and there is even a lending library for people to read there or take home. The tap room ambiance is great, with the large windows offering an open and airy feeling that is rare for bars. The book shelves and pile of board and card games also help to give things a bit of a homey feeling. It is very kid friendly, which is also something that you don’t often think of in conjunction with a place where the sole purpose is making and selling beer. There are eight taps, with three main line beers and five that rotate. The main line beers are The Dreamer, an IPA, Old Bums and Beat Cowboys, a pale ale, and Subtle Ruse, a Czech Pilsner. Of them my favorite is probably the pale ale, which is a nicely balanced beer that is quite drinkable. 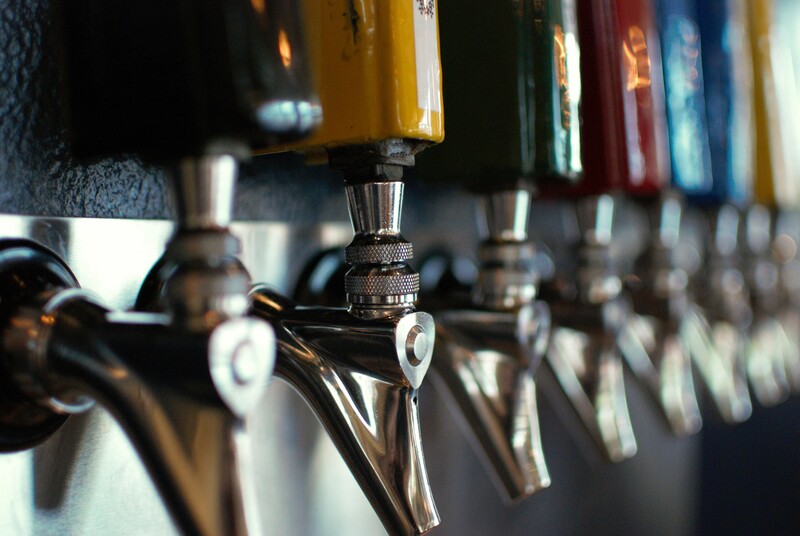 The rotating taps let the brewers experiment with some very interesting combinations. There is the green tea chocolate milk stout, the baltic porter, the dark dry hopped saison and most recently a tripel with dragonfruit. Like most great Belgian style beers, it drinks easily and packs in a hefty 8.5% abv. When I was in Japan I noticed that many craft brewers embraced the use of fruit in their beers. Brews like Hitachino Nest’s Dai Dai Pale Ale made good use of fruit flavors without overpowering things. Ryan, the head brewer and owner of Fiction, likes to use fruit in his beers a lot, and in a similar way. The dragonfruit in the Heart of Hearts does provide some of the flavor, but it’s pretty subtle. What’s not subtle is the amazing magenta color the fruit provided. Another added bit of fruit is in the Somewhere Around Barstow (3rd Edition) . This is the third in a line of experimental IPAs, now a session IPA with a dose of mango. Making really hoppy beers without having too much alcohol is hard since the malt sweetness comes at a cost of more fermentable sugars and a higher abv. Here the mango helps provide a bit of sweetness to counteract the hefty dose of hops without adding more malt. The brewhouse is a seven barrel system. One barrel is 31 gallons, so each batch at Fiction makes 217 gallons of beer. There are two seven barrel fermenters, and one fourteen barrel fermenter that can hold two batches of beer, almost 440 gallons. I actually had the opportunity to help out the other day with a double batch of the Dreamer IPA. That was quite the learning experience, seeing how things scale up from making 5 gallons on my stove to 440 gallons. Multiple 50 lb bags of grain, pounds of hops instead of ounces, and enough gallons of water you could almost float a galleon on it. It is an interesting cross between artistry and industry, and requires both strong muscles and a strong knowledge of the science of fermentation. Working at a book themed brewery has been right up my alley, and I’ve learned a lot by observing and participating in both the craft and business sides of making and selling beer. As well, getting to chat and bond with people over a shared love of great beer is rewarding, no matter what side of the bar you are on. 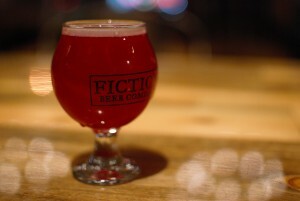 This entry was posted in American Beer, Bar Guide, Brewery Profile and tagged Denver, Fiction Beer Company, nano-breweries. Bookmark the permalink.